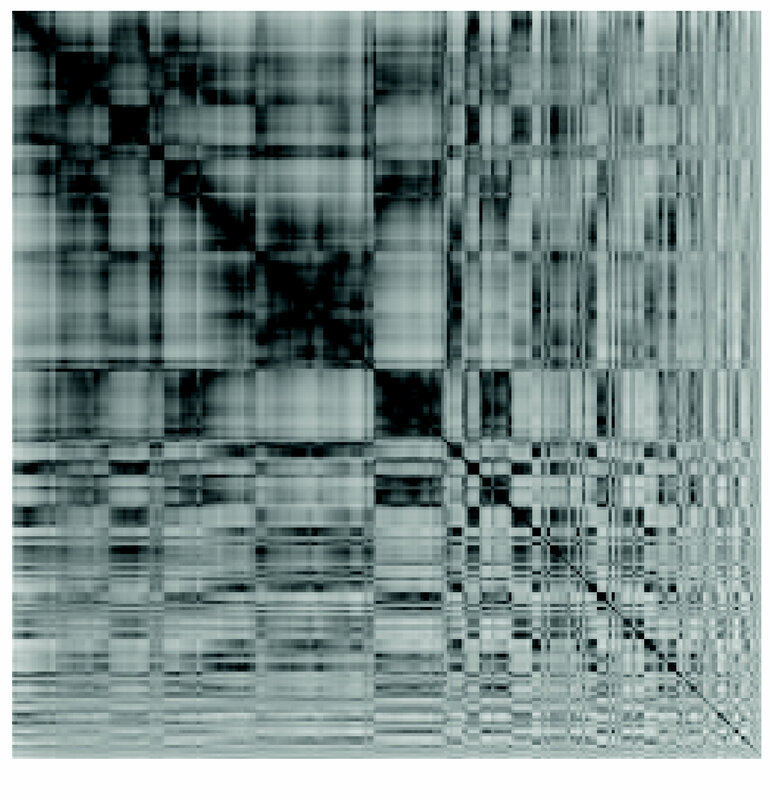 The visual assessment of tendency (VAT) technique, for visually finding the number of meaningful clusters in data, developed by J. C. Bezdek, R. J. Hathaway and J. M. Huband, is very useful, but there is room for improvements. 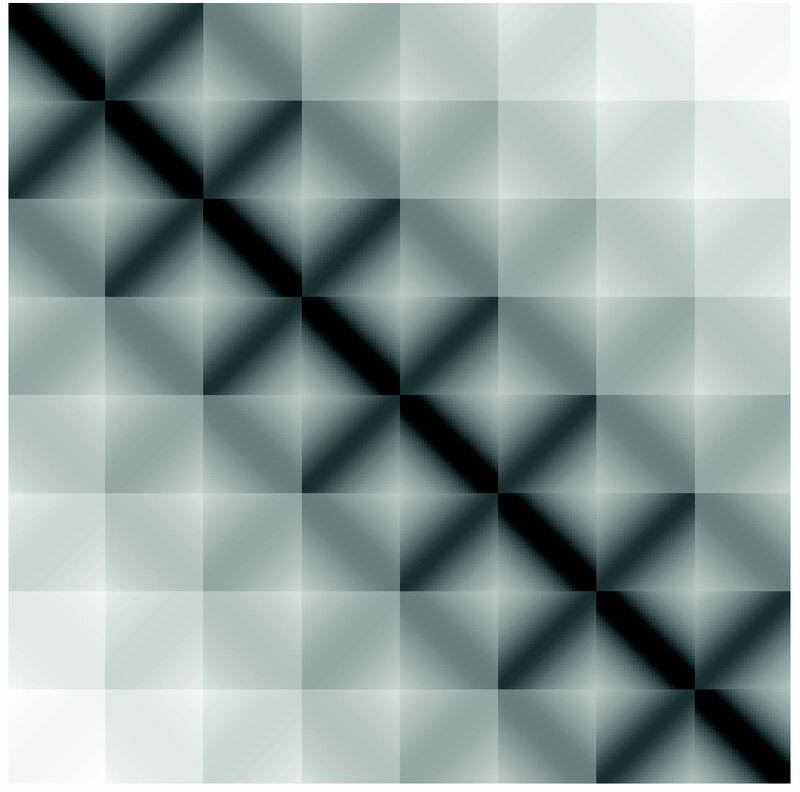 Instead of displaying the ordered dissimilarity matrix (ODM) as a 2D gray-level image for human interpretation as is done by VAT, we trace the changes in dissimilarities along the diagonal of the ODM. This changes the 2D data structure (matrices) into 1D arrays, displayed as what we call the tendency curves, which enables one to concentrate only on one variable, namely the height. One of these curves, called the d-curve, clearly shows the existence of cluster structure as patterns in peaks and valleys, which can be caught not only by human eyes but also by the computer. Our numerical experiments showed that the computer can catch cluster structures from the d-curve even in some cases where the human eyes see no structure from the visual outputs of VAT. 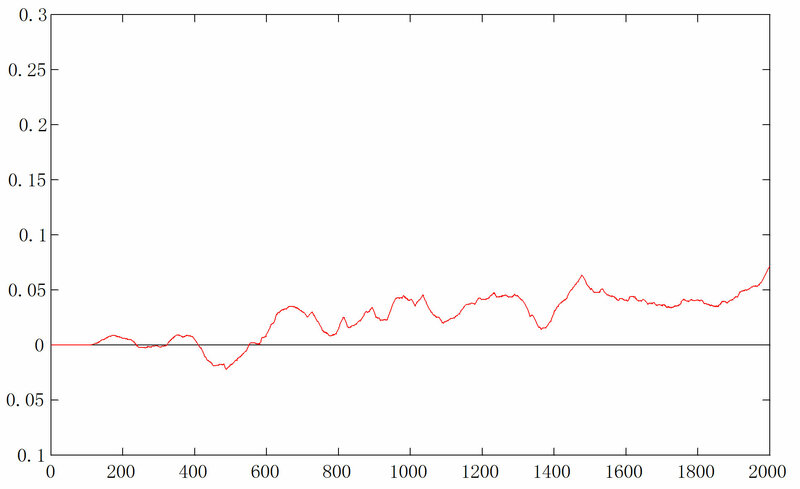 And success on all numerical experiments was obtained using the same (fixed) set of program parameter values. Clustering is the problem of partitioning a set of objects into c self-similar subsets (clusters) based on available data and some well-defined measure of similarity. The type of clusters found depends strongly on the mathematical model that underlies the clustering algorithm. 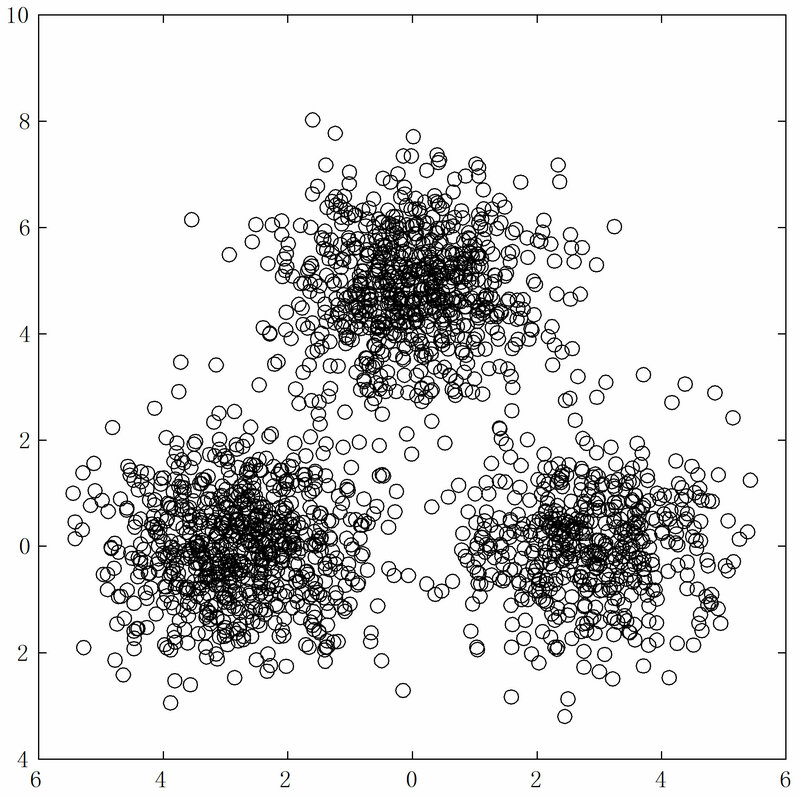 All clustering algorithms will find any number (up to n) of clusters, even if no meaningful clusters exist. Therefore before choosing a clustering method one has to decide whether there are meaningful clusters, and if so, how many are there. This is called the assessing of clustering tendency. Numerous formal (statistics-based) and informal techniques for such assessment are discussed in Jain and Dubes  and Everitt . None of these existing methods are totally satisfactory, nor will they ever be. Visual approaches for assessing clustering tendency have been widely studied in the last few decades; Tukey  and Cleveland  are standard references for visual approaches in various data analysis problems. Recently the research on the visual assessment of tendency (VAT) technique has been quite active; see the original VAT paper by Bezdek and Hathaway , also see VATr by Bezdek, Hathaway and Huband , sVAT by Hathaway, Bezdek and Huband , and reVAT and bigVAT by Huband, Bezdek and Hathaway [8,9]. The largest element of R is 1 because the VAT algorithms scale the elements of R.
VAT displays the ODM on the screen in a straightforward way, as ordered dissimilarity image (ODI). 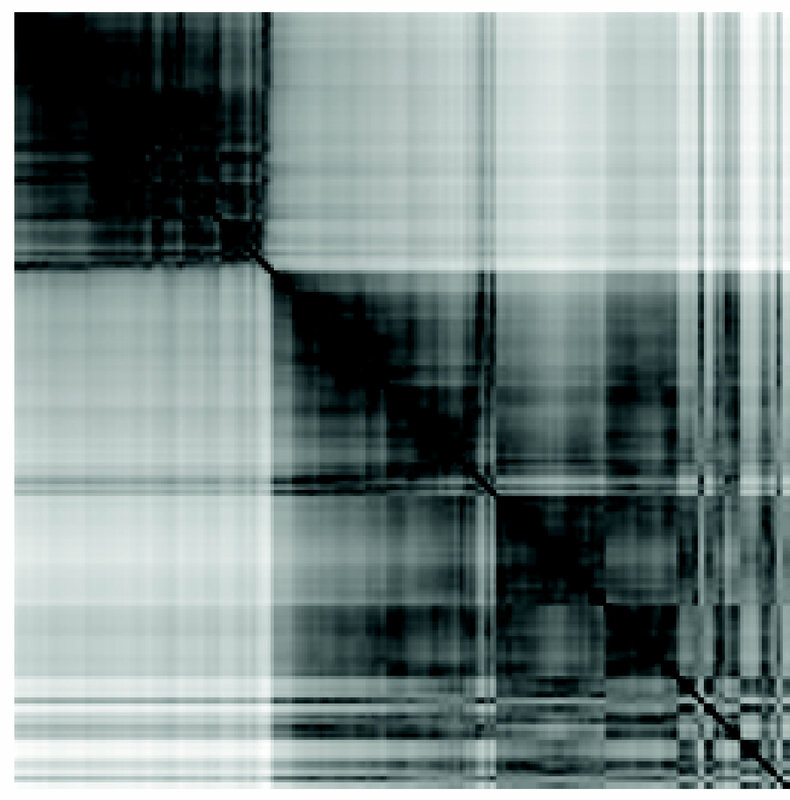 In ODI the gray level of pixel (i,j) is proportional to the value of with (pure black) if and (pure white) if . The idea of VAT is shown in the following example. Example 1. 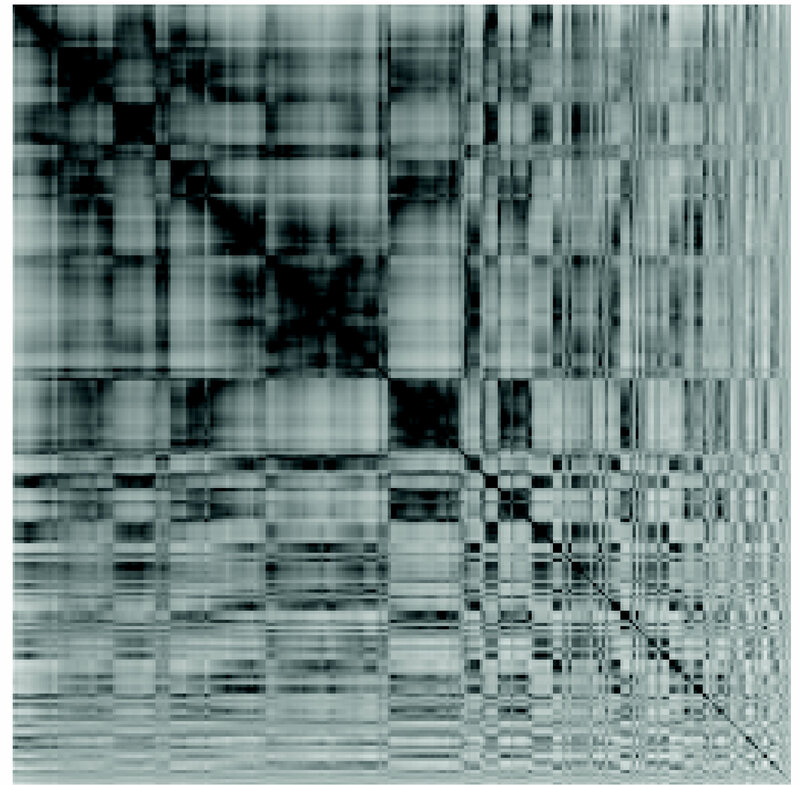 A data set of 20 points containing three well-defined clusters is shown in Figure 1. As most likely found in applications, the points in each of the clusters are not indexed together. Figure 2(a) shows the original (random) order of the points in X, with represented by a diamond. 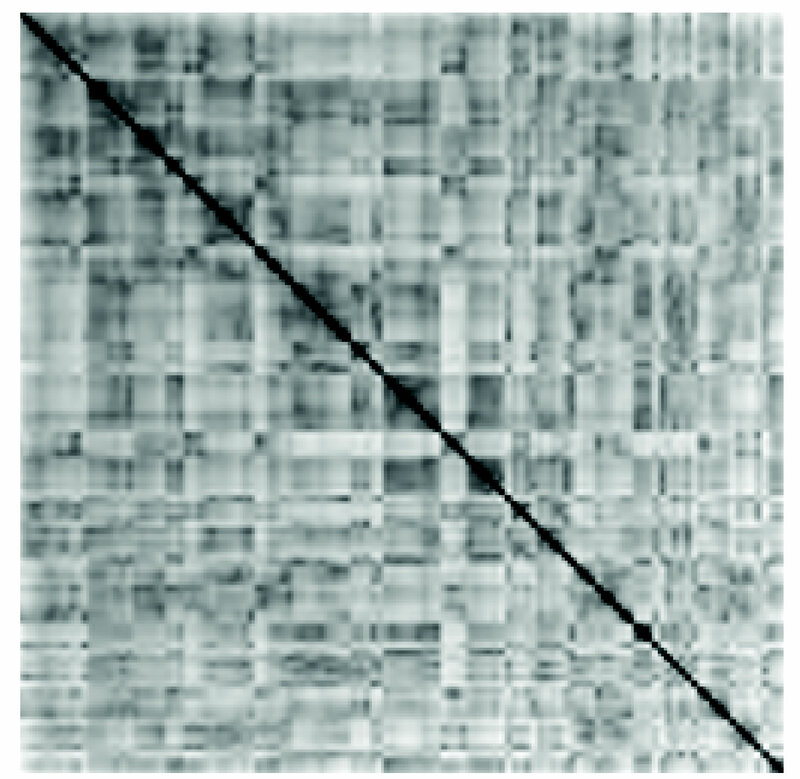 The corresponding ODI image in Figure 2(b) shows no useful visual information about the structure in X. The VAT technique can reorder the points in X so that nearby points are (generally) indexed closely. 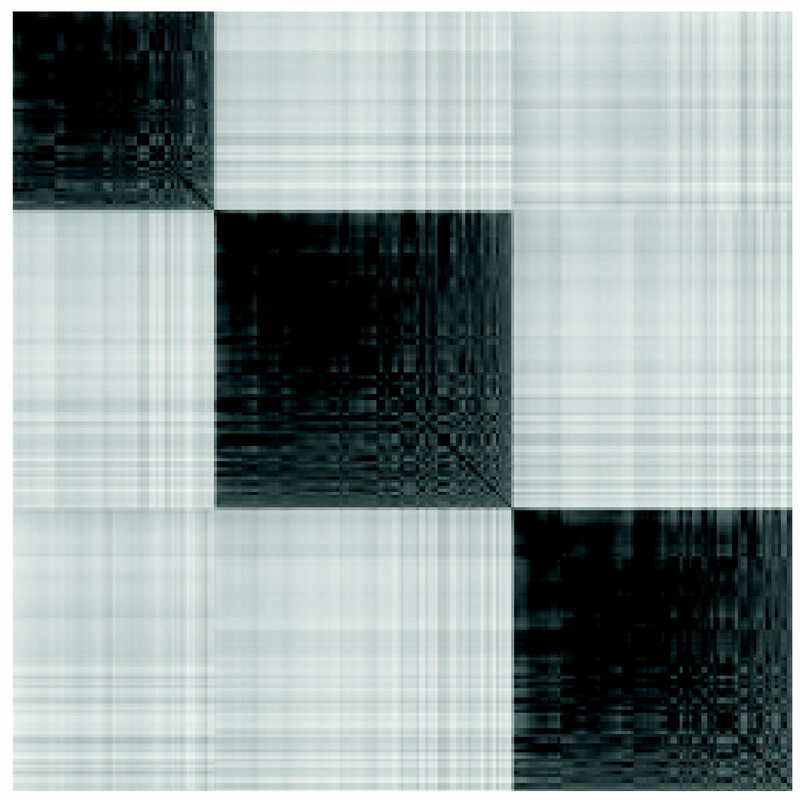 Figure 3(a) shows the new order of the data set X, with the diamond in the lower left corner representing the first point in the ordered data set. Figure 3(b) gives the corresponding ODI. Now the three clusters are represented by the three well-formed black blocks. The VAT algorithms are certainly very useful, but there is room for improvements. It seems to us that our eyes are not very sensitive to structures in gray level images. One example is given in Figure 4. There are three clusters in the data as we will show later. The clusters are not well separated, and the ODI from VAT reveals almost no sign of the existence of the structure. Figure 1. 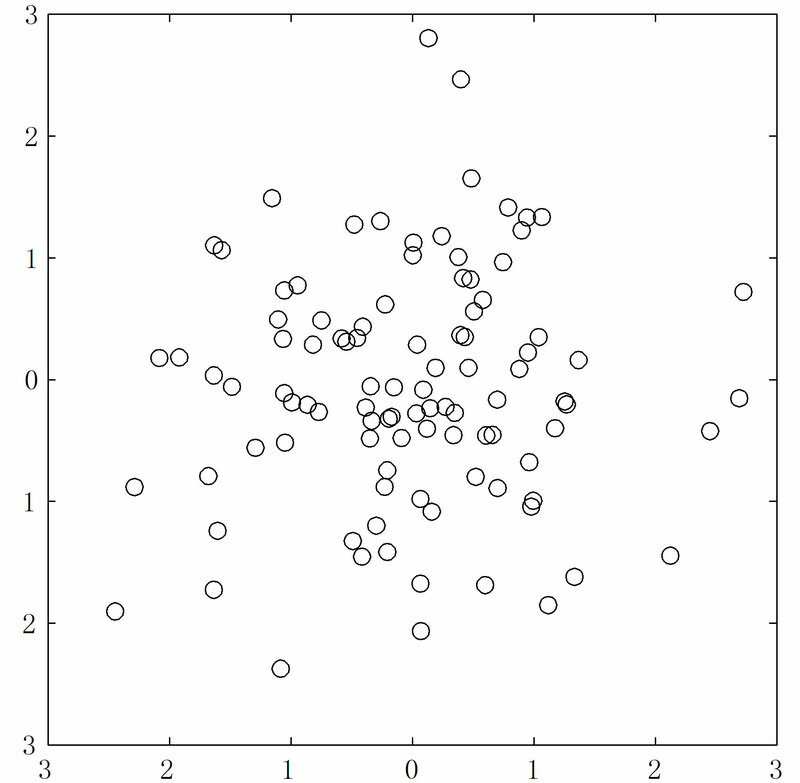 Scatterplot of the data set X. Figure 2. (a) The original order of X; (b) The corresponding dissimilarity image. Figure 3. 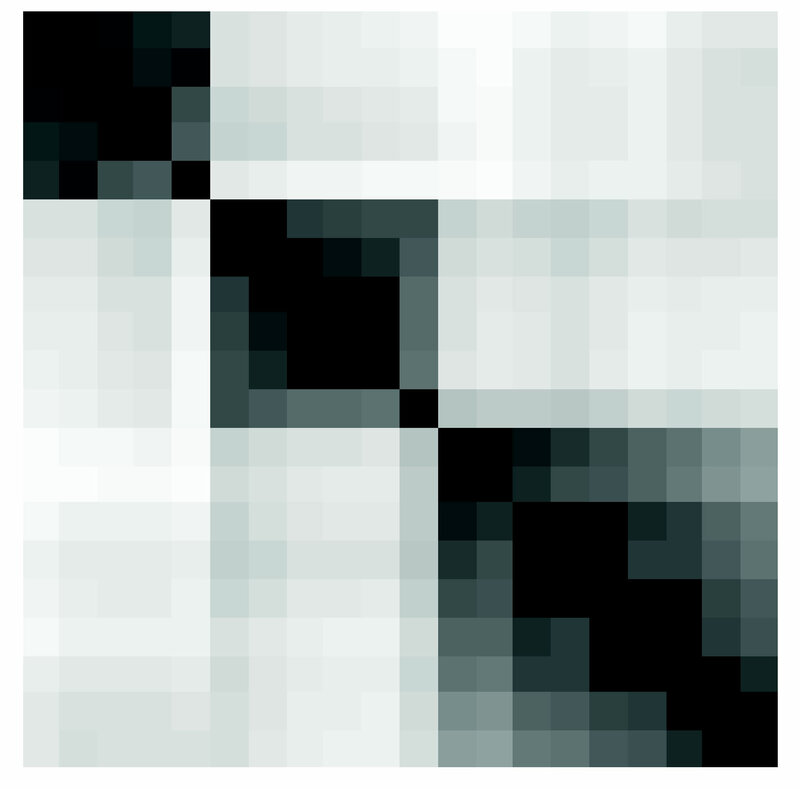 (a) The new order of X; (b) The corresponding dissimilarity image shows three clusters. will result in what we call the tendency curves. The borders of clusters in the ODM (or blocks in the ODI) are reflected as certain patterns in peaks and valleys on the tendency curves. To be exact, we will actually use only one of these curves, called the d-curve, which is the difference of two other curves. The patterns on the d-curve can be caught not only by human eyes but also by the computer. It seems that the computer is more sensitive to these patterns than human eyes are to them, or to the gray level patterns in the ODI. For example, the computer caught three clusters in the data set that produced the virtually useless ODI in Figure 4. Figure 4. How many clusters can be seen in this ODI? sizes of clusters in the data, either. This is because the VAT algorithms tend to index each cluster’s most outlying points at the very end, after all the more dense cluster cores are indexed. Whenever we say in this paper “catch clusters/blocks”, we mean the program reveals the existence of clusters/blocks. The sizes and members (or memberships) will have to be found by a clustering method, not by a tendency algorithm such as ours. We will describe our method in detail in §2 below, give numerical examples in §3, and conclude the paper with discussions and future plans in the last section. where This is the average of the elements of row i in the w-band shown in Figure 5 below. These are the elements in up to m rows above row i, inclusive, that fall in the w-band, corresponding to the region between the two horizontal line segments in Figure 5. Figure 5. Sub-diagonal band of the ODM. 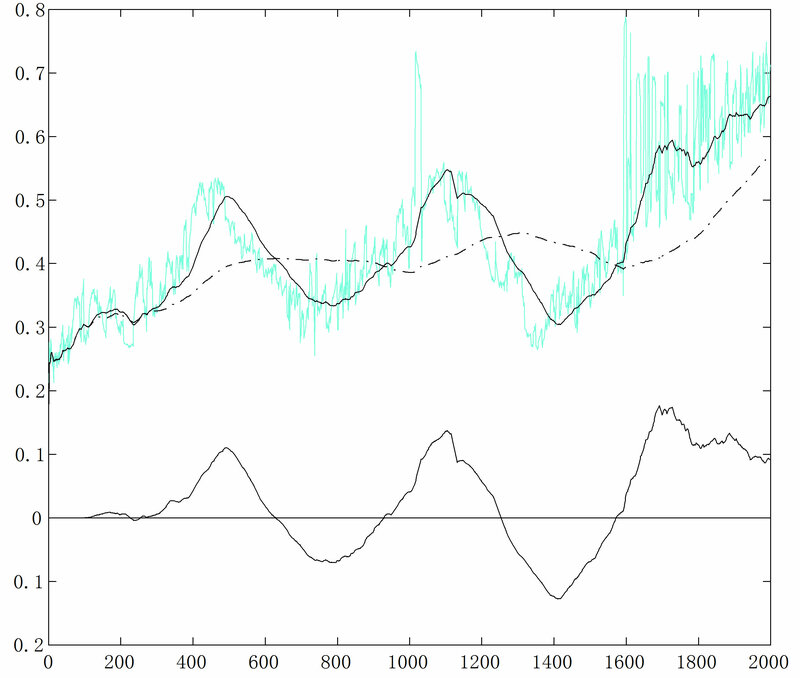 the heights of peaks on the m-curve remain roughly the same from case to case, that is, when clusters are well formed. But again there are less-than-ideal situations, in which there are outliers. The VAT algorithms tend to order outliers near the end, so the m-curve tends to move up toward the right, which is fine to human eyes but makes it hard for the program to identify peaks and valleys using thresholds. This is why we introduce the M-row moving average, called the M-curve. The M-curve is defined in the same way as the m-curve except with m replaced by M. The M-curve shows long term trends of the r-curve. We are, however, NOT interested in the M-curve itself. We use the M-curve to “correct”, or to level up, the m-curve, by subtracting the former from the latter. It is the difference of the mand M-curves, which we call the d-curve, that we are interested in. The d-curve retains the shape of the m-curve but is more horizontal, basically lying on the horizontal axis. 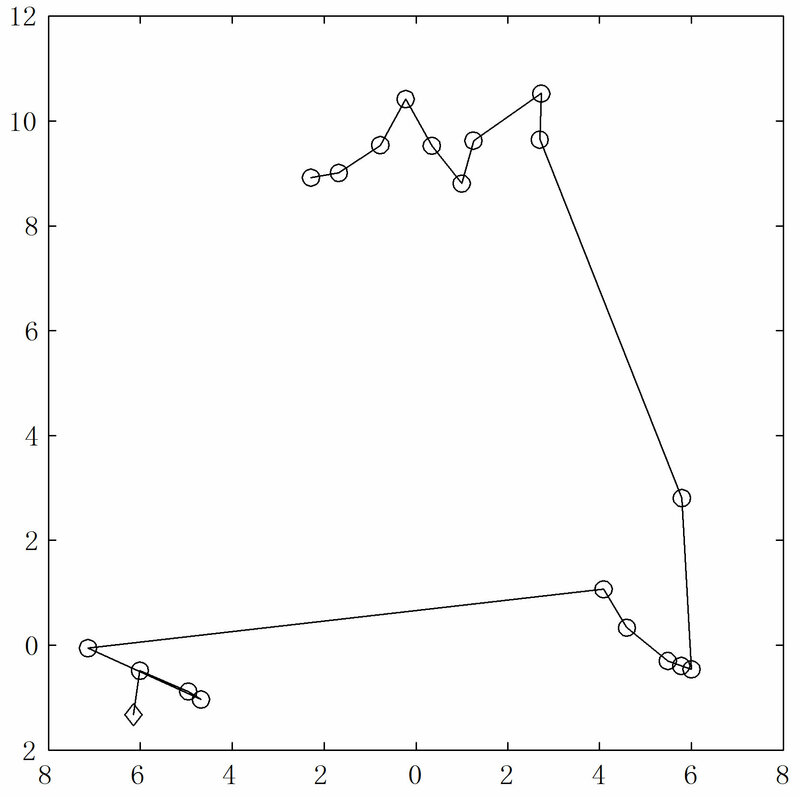 Furthermore, the M-curve changes more slowly than the m-curve, thus when moving from one block into another block in the ODM, it will tend to be lower than the m-curve. 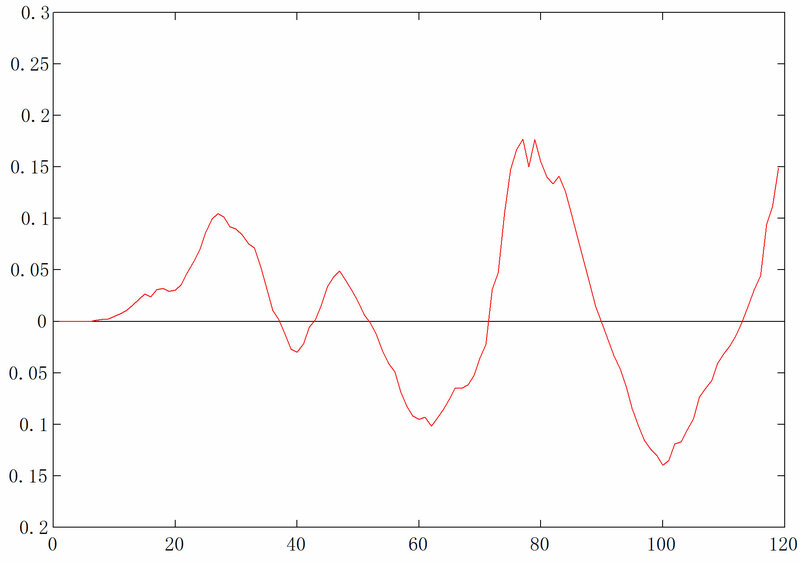 As the result, the d-curve will show a valley, most likely below the horizontal axis, after a peak. It is the peak-valley, or high-low, patterns on the d-curve that signal the existence of cluster structures. This will become clear in our examples in the section that follows. Although the d-curve is the only curve we really need, we will also show other tendency curves, that is, the r-, mand M-curves, in the first few examples to show the reader how the idea evolved from an intuitive r-curve to the final, rather technical, d-curve. Remark: It may seem much more natural to define the i-th element of the r-curve as the average of all such that the object is in the same cluster as and Actually this is what we tried at the very beginning of this work. More precisely, we set in definition (2) at the beginning of the calculation, and once we believed we had found a new cluster, we reset to the index of the element we believed to be the first one in the new cluster. There were several problems. First, neither the VAT algorithms nor our program can accurately locate the borders of clusters in terms of the index values. Second, any possible patterns obtained that way were self-fulfilled: once we reset all curves went back to zero, and then it would look like there was indeed a new cluster. It would literally tear the tendency curves apart, and distort all possible high-low patterns. where n is the number of objects in the data set. 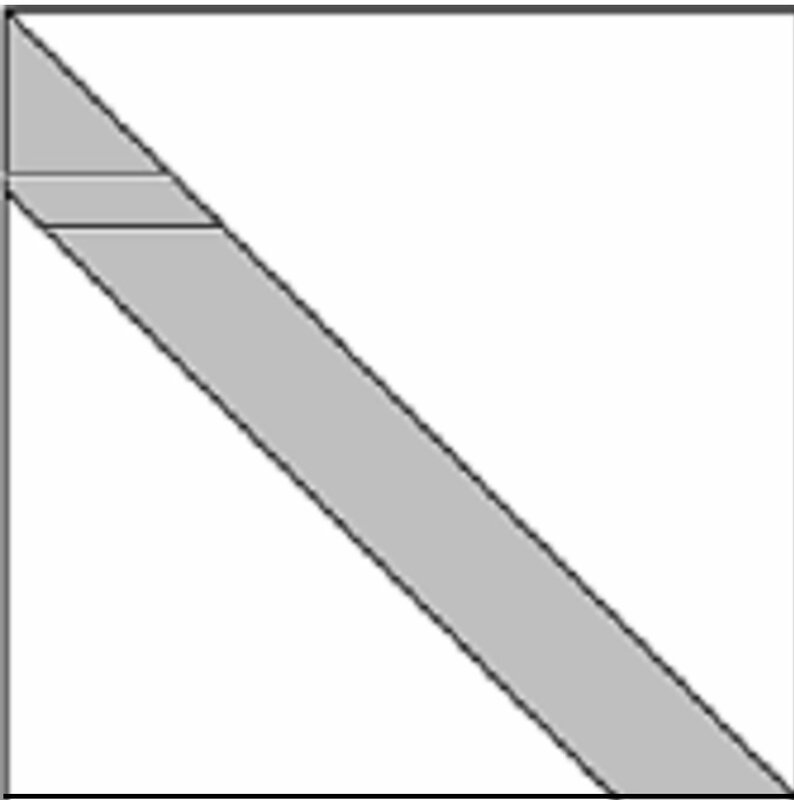 Here the ceiling function is used for m so that it is at least 1 even if n is very small. And these are the values we recommend to possible users of our algorithm when there is no clear reason to change them. Discussion on how the values of these, and two other, parameters were chosen can be found later in the section. The pictures for (Figure 6) show what we should look for on the curves. The clusters are very well separated, and the ODI has three black blocks on the diagonal with sharp borders. Our r-curve (the one with “noise”) has two vertical rises and the m-curve (the solid curve going through the r-curve where it is relatively flat) has two peaks, corresponding to the two block borders in the ODI. The M-curve, the smoother, dash-dotted curve, is only interesting in its relative position with respect to the m-curve. 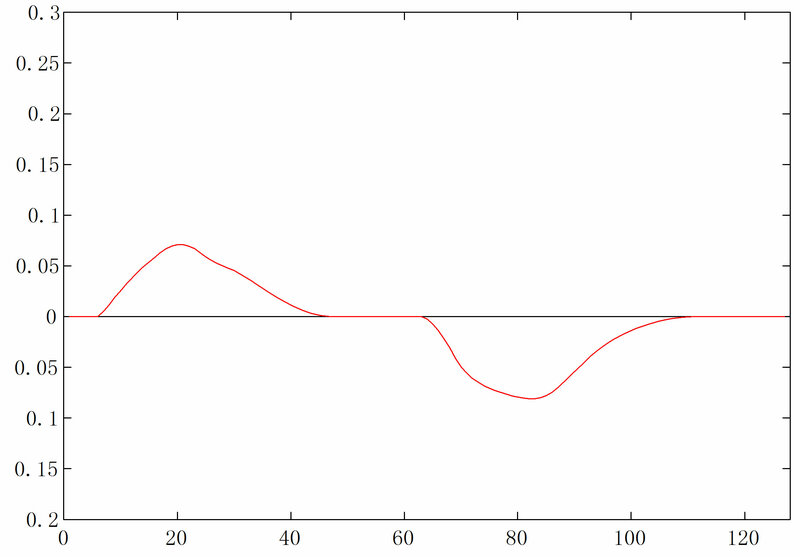 That is, it is only useful in generating the d-curve, the difference of these two curves. 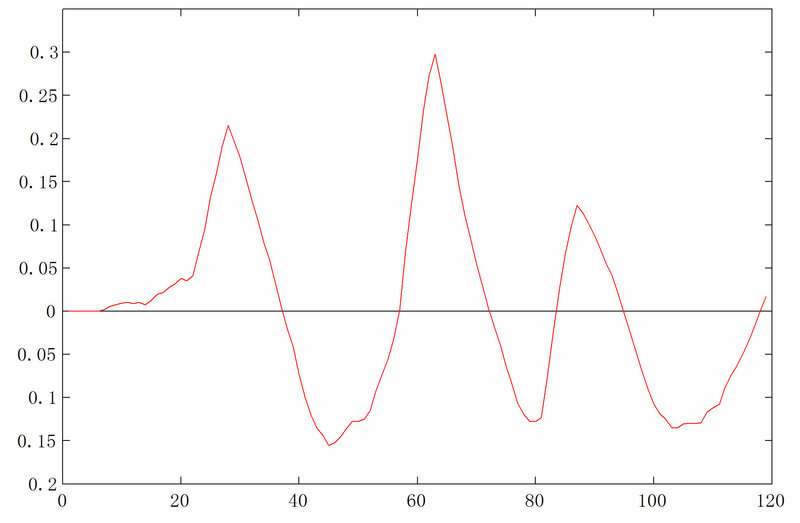 The d-curve looks almost identical to the m-curve, also having two peaks and two valleys. The major difference is that it is in the lower part of the figure, around the horizontal axis. 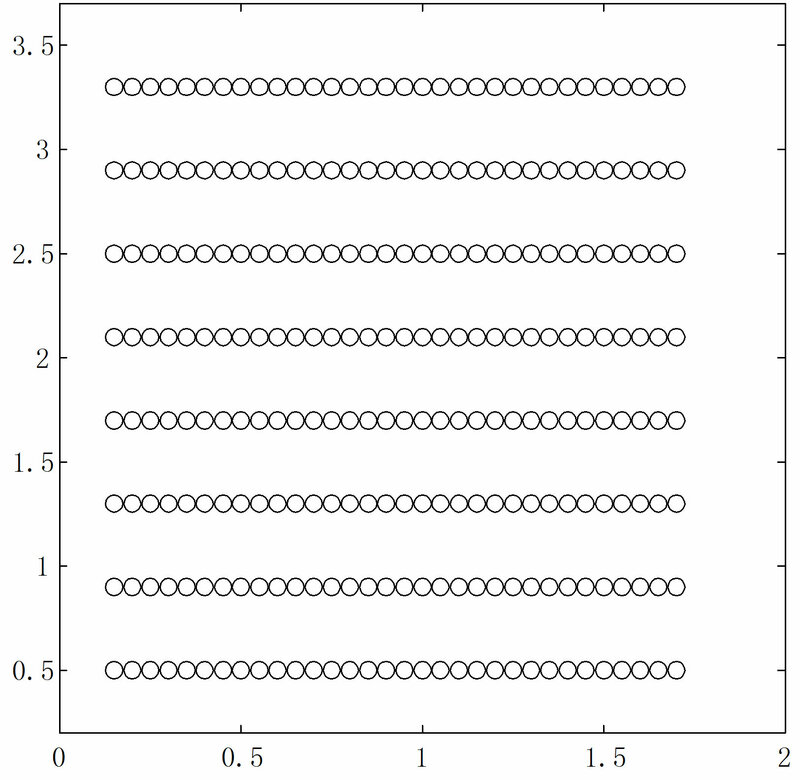 Figure 7 shows the case The clusters are less separated than the case and the slopes of the tendency curves are smaller. There are still two vertical rises on the r-curve, and two peaks followed by two valleys on all other curves where the block borders are in the ODI in part (b). 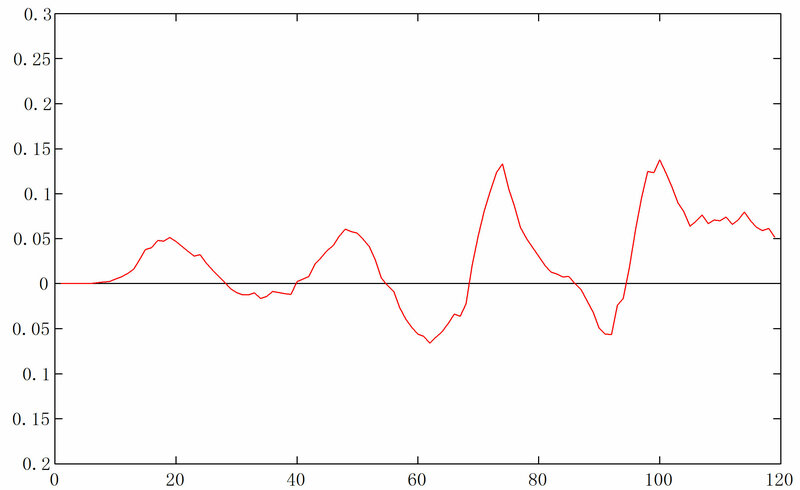 What is really different here from the case is the wild oscillations near the end of the r-curve, bringing up all other three curves. This corresponds to the small region in the lower-right corner of the ODI, where there lacks pattern. Note that no valley follows from the third rise or peak. This is understandable because a valley appears only when the curve index (the horizontal variable of the graphs) runs into a cluster, shown as a block in ODI. 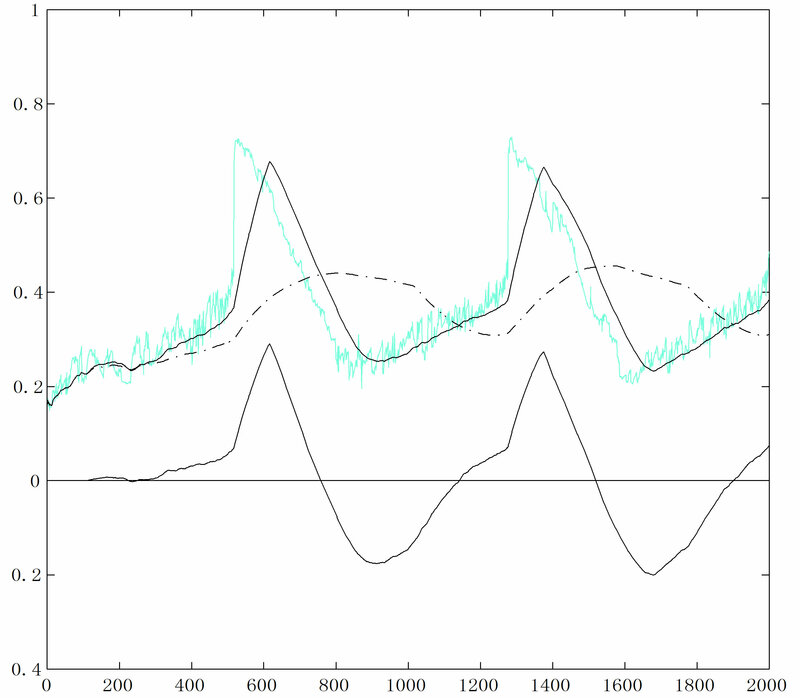 Now we know what we should look for: peaks followed by valleys, or high-low patterns, on the r and d-curves. 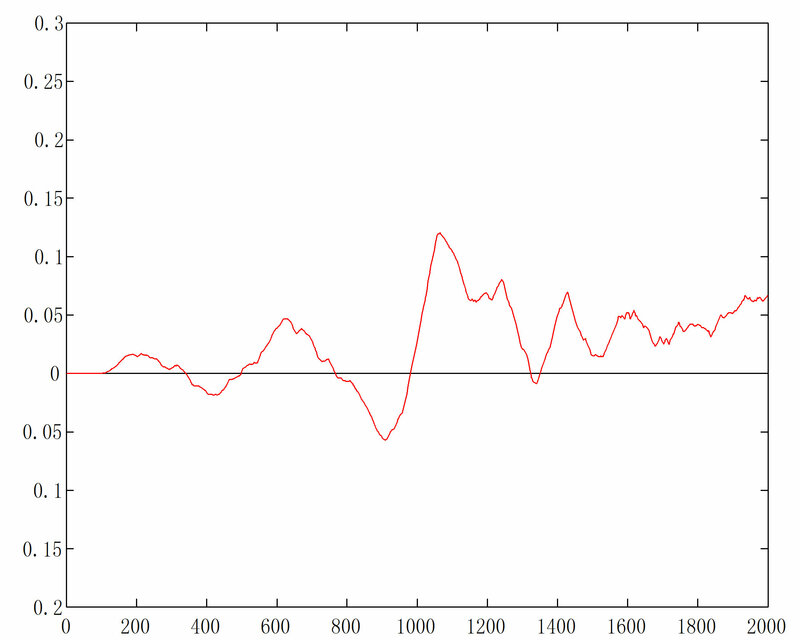 Later on we will show that even the r-curve is not good enough and only the d-curve will do the job. The case is given in Figure 8. 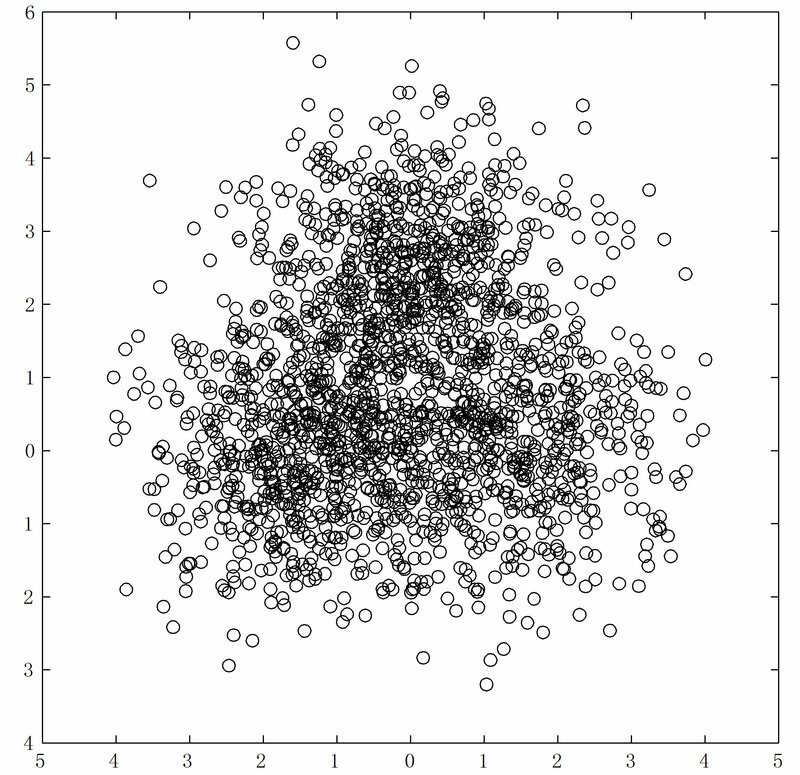 One can still easily make out three clusters in the scatterplot, but it is hard to say to which cluster many points in the middle belong. It is expected that every visual method will have difficulties with them, as evidenced by the lower right corner of the ODI, and the oscillations on the last one fifth of the r-curve. 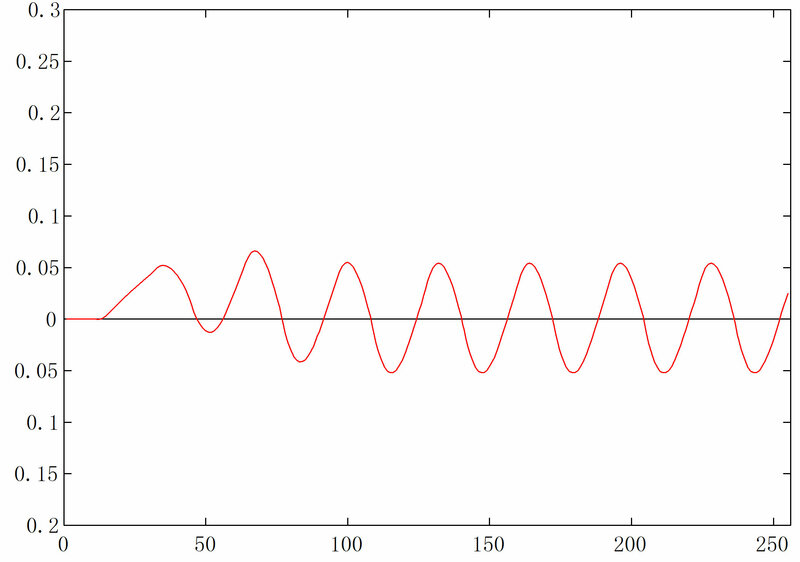 The oscillations bring up the mand M-curves, but not the d-curve. The d-curve remains almost the same as those in the two previous cases, except the third peak becomes larger and decreases moderately near the end, without forming a valley. The two high-low patterns on the mand d-curves show the existence of three clusters. As we have said earlier that it is a valley on the m-curve and, especially, the d-curve that signals the beginning of a new cluster. 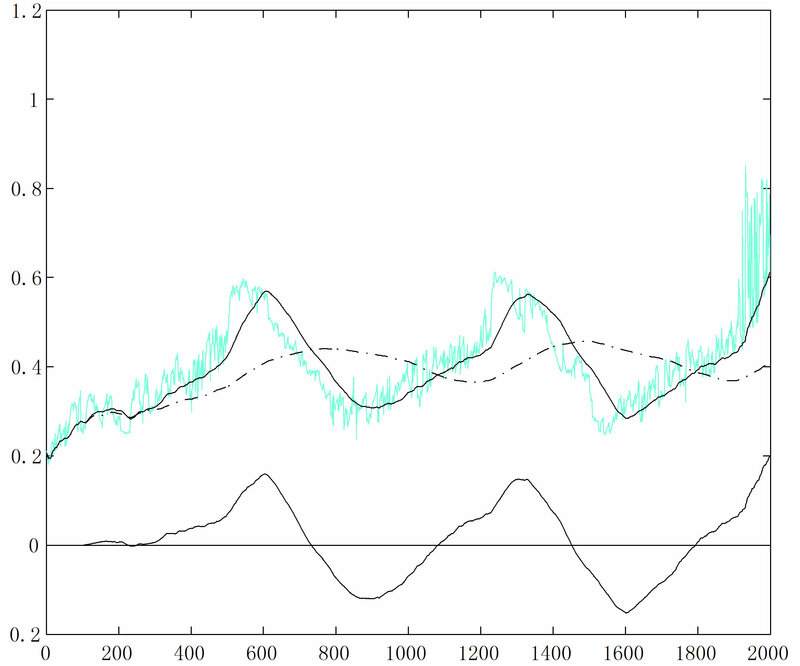 Note that the m-curve goes up with wild oscillations so much in Figure 8(c) that its right end rises higher than any peak on it, which makes it hard for the computer to catch the high-low patterns, at least hard with thresholds. That is why we introduced the more technical d-curve to replace the intuitive m-curve, which had earlier replaced the more intuitive but often noisy r-curve. The d-curve remains mostly level, close to the horizontal axis, thanks to the compensation it gets from the M-curve. Also, unlike the other three curves, its values never get too high or too low, which enables us to catch the high-lows easily. As a consequence, our VATdt algorithm only uses the d-curve to access the tendency. And we will only display the d-curve in the remaining part of the paper to show the reader a cleaner view, although we ourselves often feel the rand m-curves visually informative. We use two thresholds to detect high-lows. When the d-curve hits a ceiling, set as 0.04, and then a floor, set as 0, the program reports one new cluster. These ceiling and floor values are satisfied by all cases in our numerical experiments, even those not reported here, where the clusters are reasonably, sometimes only barely, separated. If we lower the ceiling and raise the floor, we would be able to catch some of the blended clusters we know we have missed, but it would also increase the chance of “catching” false clusters. We are not saying these values are the best. Any values are arguable, as arguable as the number of clusters is when the clusters are blended. We do not like the idea of tuning parameters to particular examples, and will stick to the same ceiling and floor values throughout this paper. In fact, we will stick to the same set of values for all parameters in our program, that is, the values for the ceiling and floor set here, and those for m, M and w given in (3). Figure 6. Three normally distributed clusters in with (a) Scatterplot; (b) ODI from VAT; (c) Tendency curves. however, picks up cluster structure from the ODM. It has several high-lows, with two of them large enough to hit both the ceiling and floor, whose peaks are near 600 and 1000 marks on the horizontal axis, respectively. This example shows that our tendency curves are more sensitive than the raw block structure in the 2D display ODI. 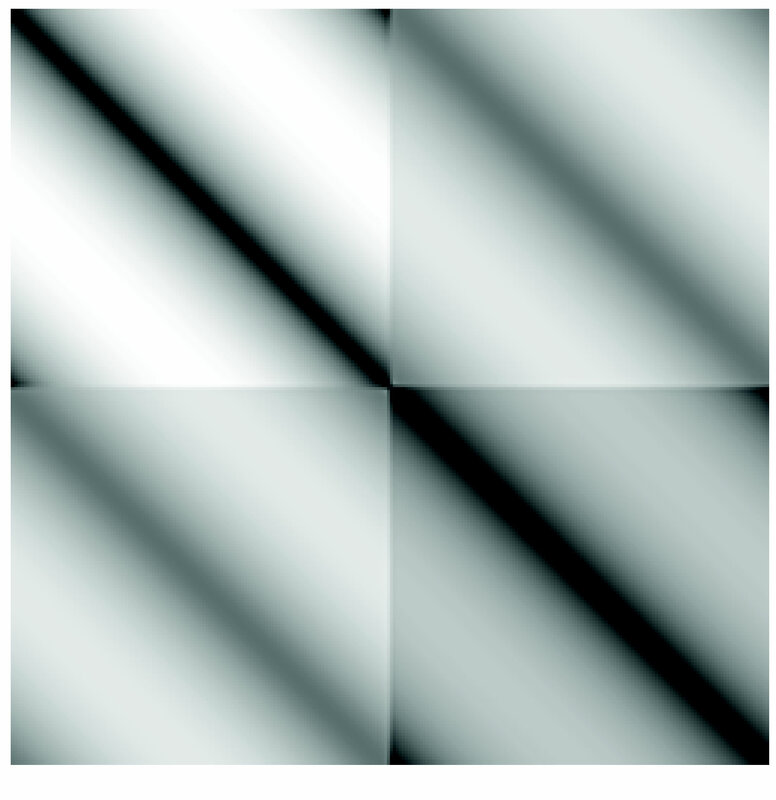 The largest advantage of the tendency curves is probably the quantization of gray level patterns which enables the computer, not only human eyes, to catch possible patterns. Figure 7. Three normally distributed clusters in with (a) Scatterplot; (b) ODI from VAT; (c) Tendency curves. only saying that our program can be sensitive enough to “see” three clusters in this case. When goes down to zero, the cluster structure disappears. 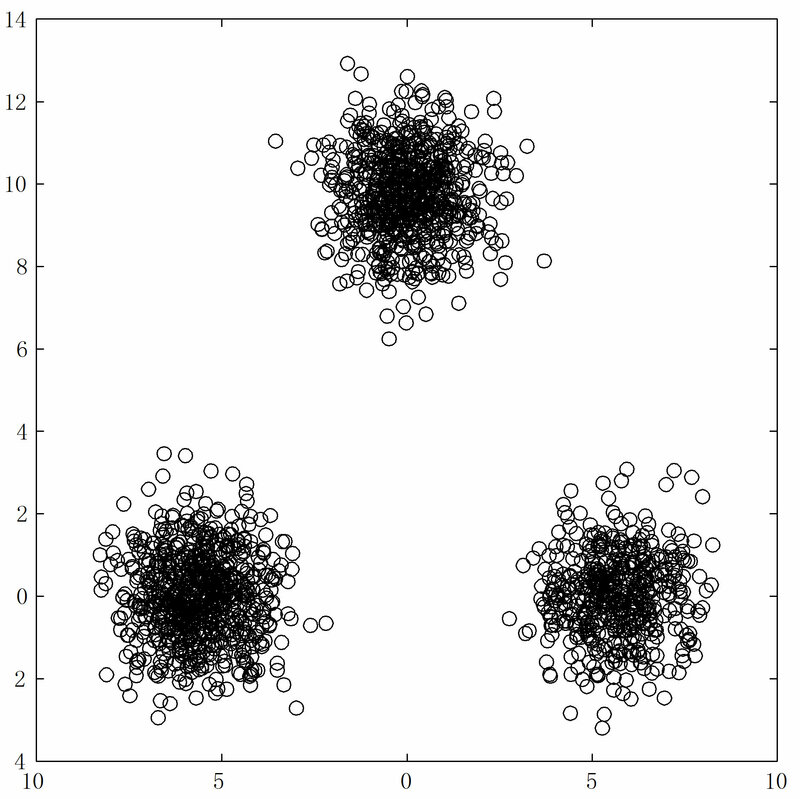 The scatterplots for (Figure 10(a)) and (not shown) are almost identical, showing a single cluster in the center. The d-curves for both cases (Figures 10(b) and (c)) have no high-lows large enough to hit the ceiling then the floor, which is the way they should be. Figure 8. Three normally distributed clusters in with (a) Scatterplot; (b) ODI from VAT; (c) Tendency curves. are similar to those in and so is the way they deteriorate as the value of decreases. The d-curves for 4 and 3 are given in Figure 11. There are three clear high-lows on each of them, revealing the existence of four clusters, which we think is appropriate since the values are relatively large. Figure 12 gives another example in which the ODI from VAT (in part (a)) fails to show any useful visual information on the structure, but our program identified three high-lows (between the 40 and 80 marks), or four clusters, from the d-curve. Remark: We remind the reader that the positions of the peaks and valleys do not reflect the sizes of the clusters closely unless the clusters are very well separated. Figure 9. Three normally distributed clusters in with (a) Scatterplot; (b) ODI from VAT; (c) d-curve. Does our method always say what it should say? Well, there is not, and there will never be, an infallible method to determine the number of clusters. In many cases, there are no right or wrong answers; it all depends on what one means by “should”. The data set used in Figure 13 was generated the same way as that in Figures 10(a) and (b) where except that it contains only 100 observations. So there “should” be only a single cluster. But both the ODI from VAT and our d-curve show some structure, and our program “caught” three clusters. 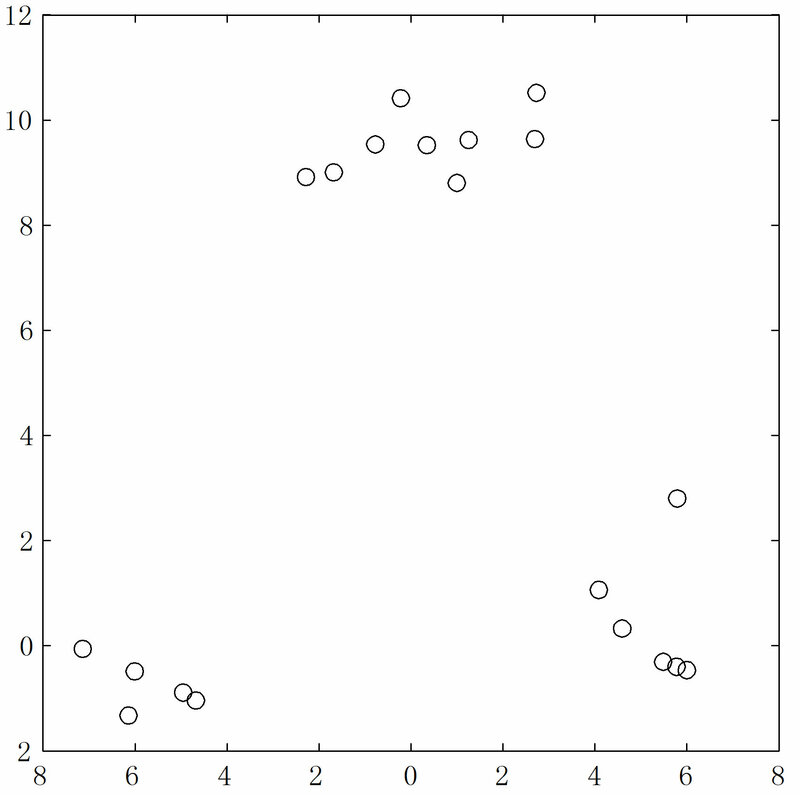 If one compares the scatterplots in Figures 10 and 13, one can find that there is a single well-shaped cluster in Figure 10 while there are only scattered points in Figure 13. If the number of points is small, there is a difference between what a random generator is intended to generate and what it actually generates. part (b) has a periodic nature, but no blocks. Bezdek and Hathaway  conclude from the ODI generated from a similar data set that “it is reasonable to conjecture that the underlying data fall into 8 very regular clusters”. 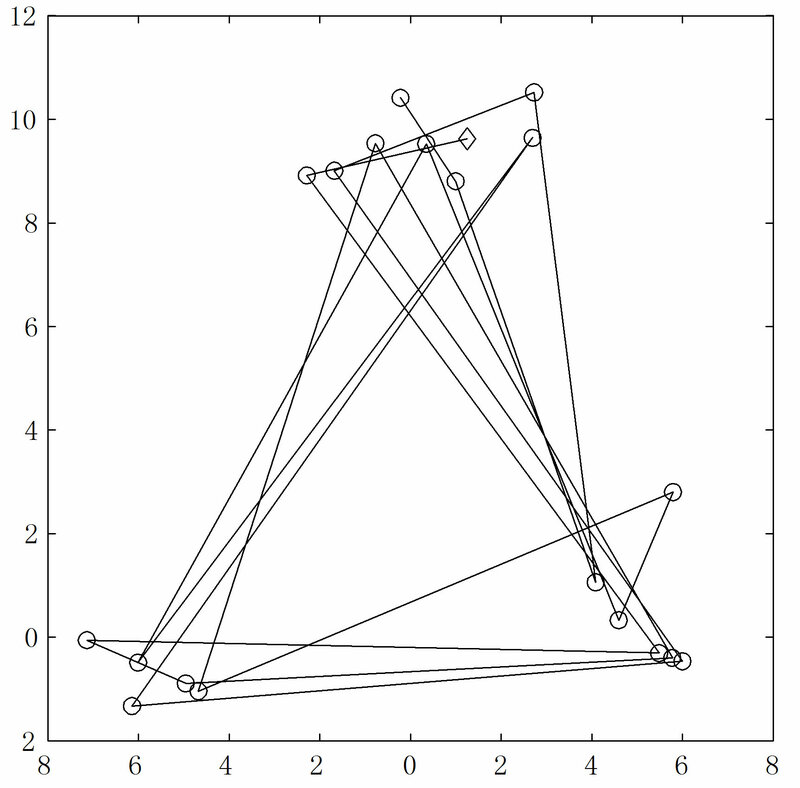 The d-curve shown in part (c) is almost sinusoidal, with the highs and lows far beyond the ceiling and floor, strongly indicating the existence of 8 clusters (which are rows). Remark: Our program works on the original example in  just as fine. We made the changes here so that it looks more like 8 clusters instead of a single rectangular cluster. 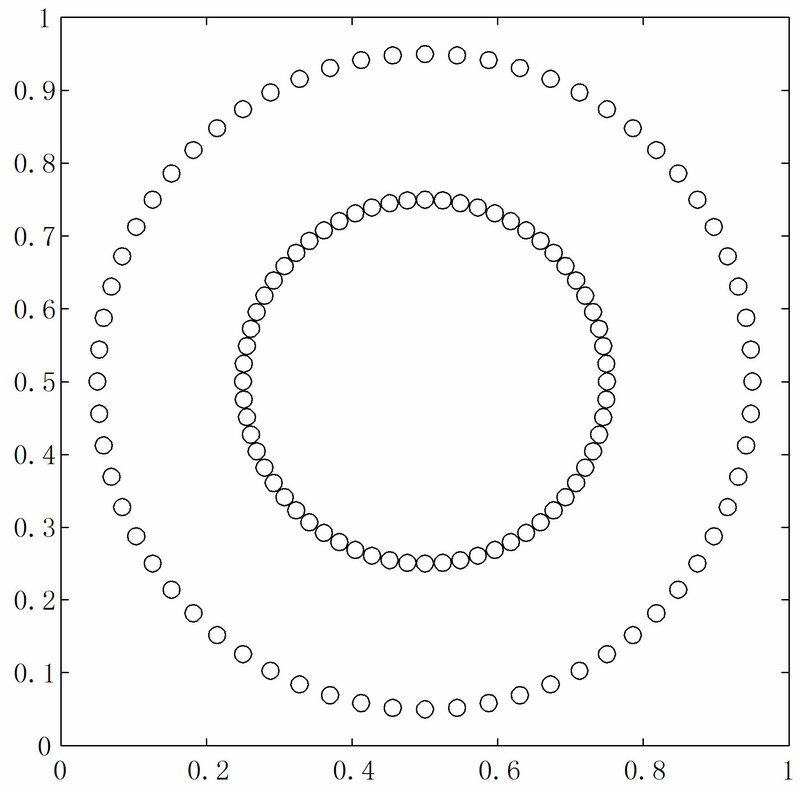 In Figure 15, 64 points are equally distributed on a circle of radius 0.45 centered at (0.5, 0.5), and another 64 on a concentric circle of radius 0.25. 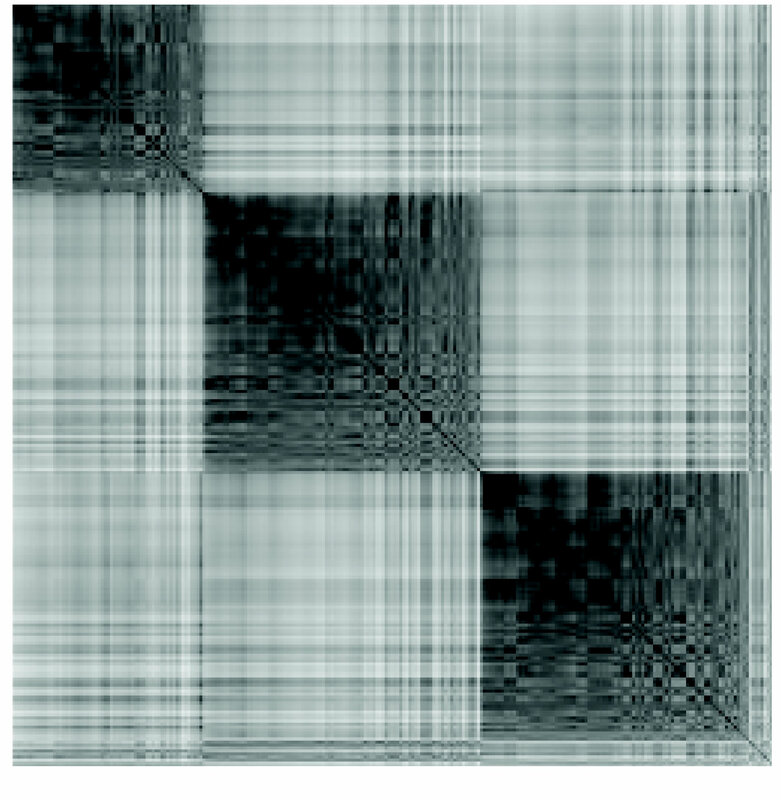 This ODI does not contain black blocks either, only a block form; see Figure 15(b). Based on this block form Bezdek and Hathaway  infer that the data consist of two similar, regular structures. Our d-curve in Figure 15(c) has a single high-low pattern on it, and the program reported the existence of two clusters. Figure 12. Four normally distributed clusters in for (a) ODI from VAT; (b) d-curve. puter caught the large high-low on the left and ignored the small one on the right, and reported the existence of two clusters. Once again one may argue on the correctness of the program ignoring the smaller high-low (thus the choice of the ceiling value), just as one can argue on the “correct” number of clusters in the Iris data. Figure 13. 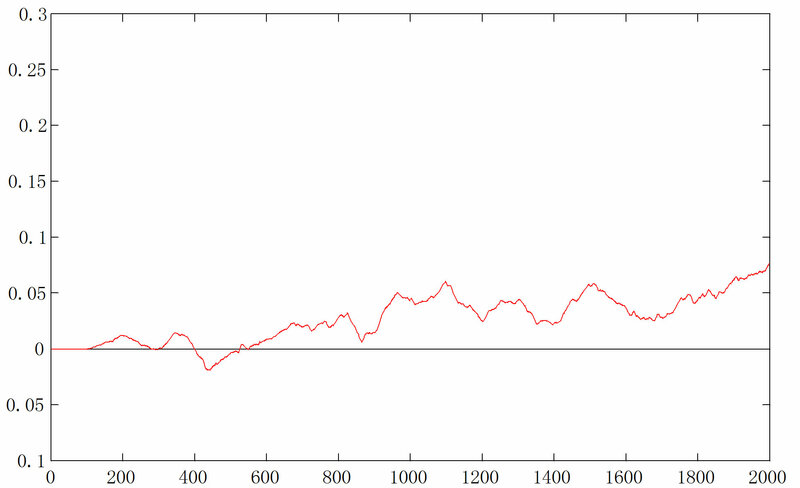 One hundred normally distributed points in . (a) Scatterplot; (b) ODI from VAT; (c) d-curve. Figure 14. Points regularly distributed along parallel lines (a) Scatterplot; (b) ODI from VAT; (c) d-curve. Figure 15. 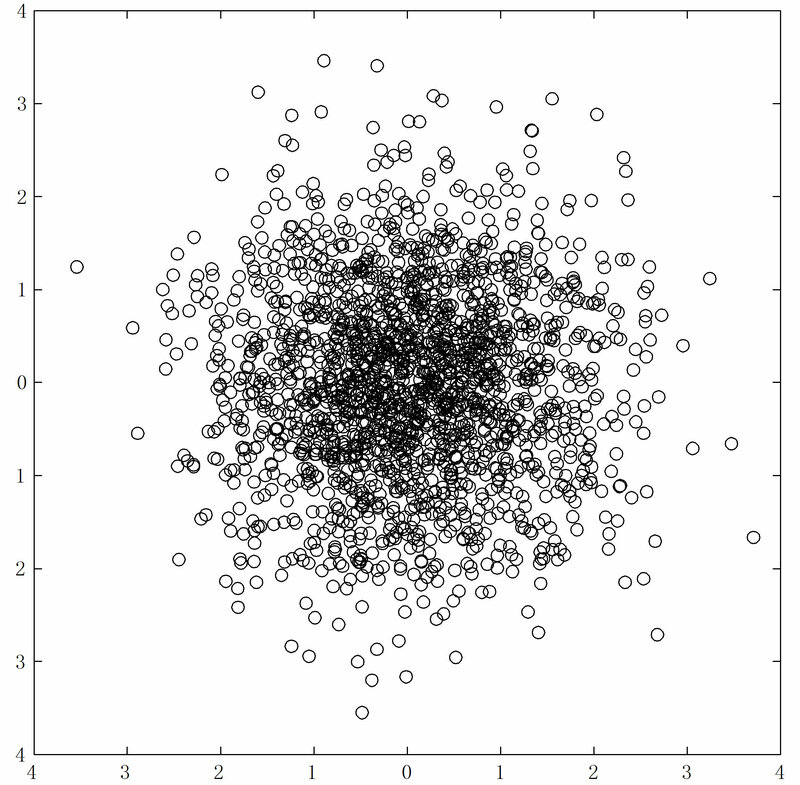 Points regularly distributed along a pair of concentric circles (a) Scatterplot; (b) ODI from VAT; (c) d-curve. Figure 16. (a) ODI for the Iris data from VAT; (b) d-curve. ended up with the values in (3) from experiments. First, we want as small a value for m as possible so that relatively small clusters will not get lost in the averaging process. 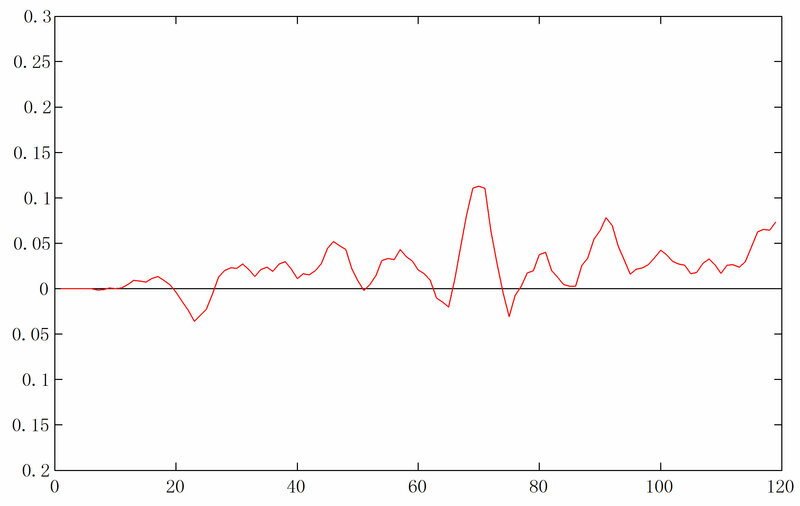 But if it gets too small, the m-curve would get noisier and noisier and eventually fall back to the r-curve. We also want it as a percentage of n so that we do not have to change it to suit data sets of different sizes. Five percent is the smallest we dare go, (n often gets below 100, and then we are only looking at the average of a few rows), and it works very well. The performance of the program is not sensitive at all to the changes in M. As long as it is several times larger than m, we did not see much difference. The value of w makes a difference only occasionally, and, when it does, only marginally. We tried values from to 5n, and all of them worked fine. All in all, the value worked best, but the difference was insignificant. Thus we decided that a single set of parameter values could successfully be used for all cases, which is a rare situation for clustering procedures invol­ving user-selected parameter values. One scenario in which we foresee the need of changing parameters is when the ratios of the cluster sizes in a data set are so large that (relatively) small clusters get lost in the averaging, causing the d-curve valleys to be too shallow to hit the floor. One will then need to decrease the values of m and w, which may help form larger high-low patterns on the d-curve. We would feel comfortable adjusting the values of the ceiling and floor if there are “clean” high-low patterns on the d-curve, that is, if there are not many zigzags when the curve goes up and down. When changing parameter values, we recommend the user to look at the r-curve, too. 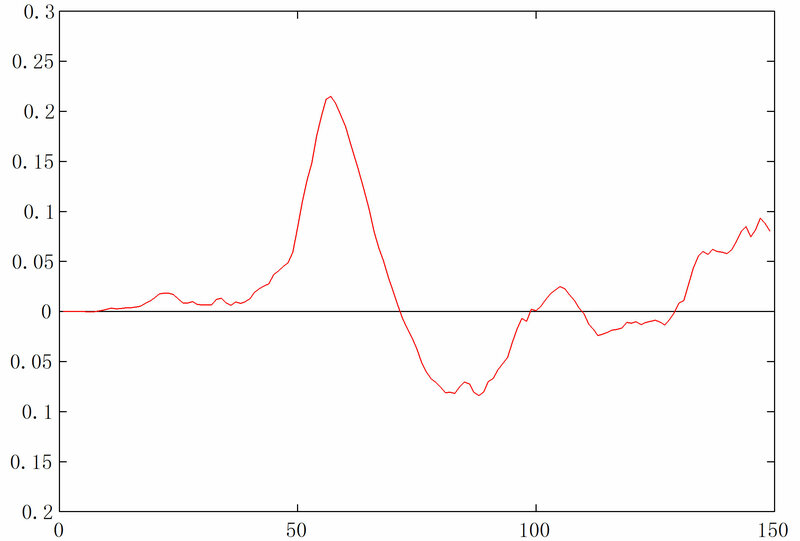 One should feel more confident if the r-curve does not show too much noise. Our VATdt algorithm is meant to replace the straightforward visual displaying part of the VAT algorithms mentioned in the second paragraph of §1. Or, for that matter, it can start from an ordered dissimilarity matrix from any algorithm of that kind. Instead of displaying the matrix as a 2-dimensional gray-level image ODI for human interpretation, VATdt analyzes the matrix by taking averages of various kinds along its diagonal and produces the tendency curves, with the most useful of them being the d-curve. 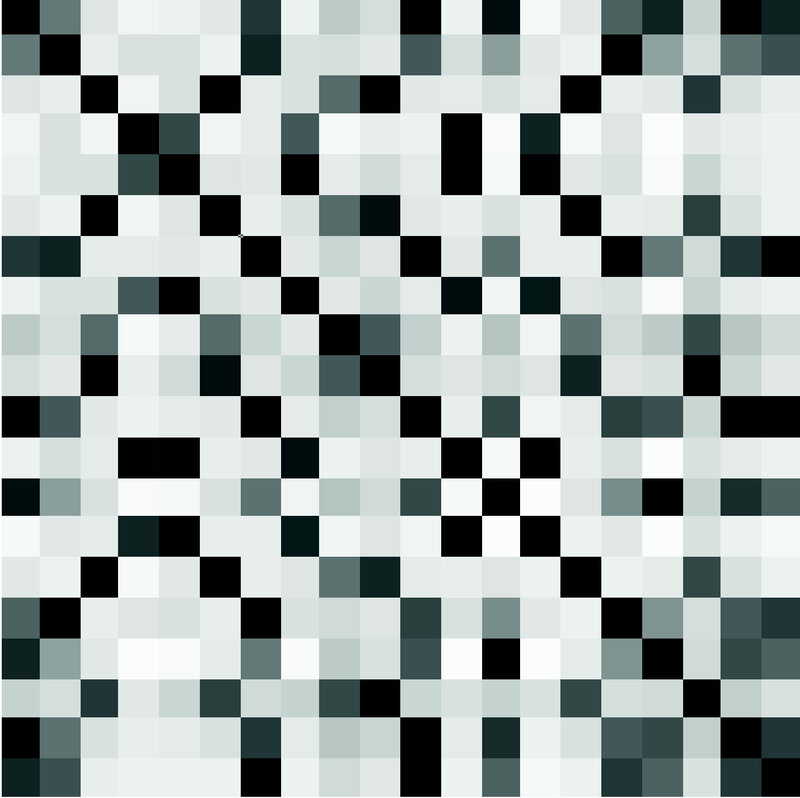 This changes 2D data (a matrix) into a 1D array, which is certainly easier to both human eyes and the computer since the concentration is now only on one variable—the height. Possible cluster structure is reflected as high-low patterns on the d-curve with a relatively uniform range that enables the computer to catch them with thresholds. The values of thresholds may be arguable, but no more so than the “right” number of clusters that exist in a given data set. For example, some see only one single cluster in Figure 9(a) while we see three. 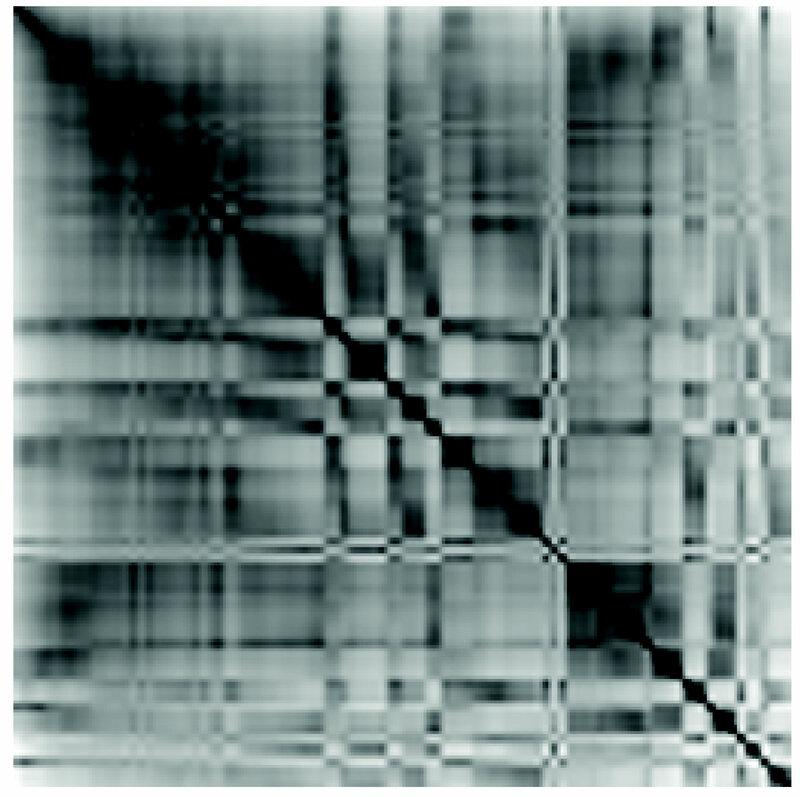 Our experiments show that the computer is more sensitive to high-low patterns on the d-curve than human eyes to patterns in 2D graylevel images. We are truly encouraged by the two examples in Figures 14 and 15 where the ODI images do not have blocks but the d-curve still did the job nicely. An ODI shows blocks only if the data set contains (elliptical) diskshaped clusters in 2-dimensional feature space, or ellipsoidor ball-shaped clusters in feature spaces of higher dimensions. 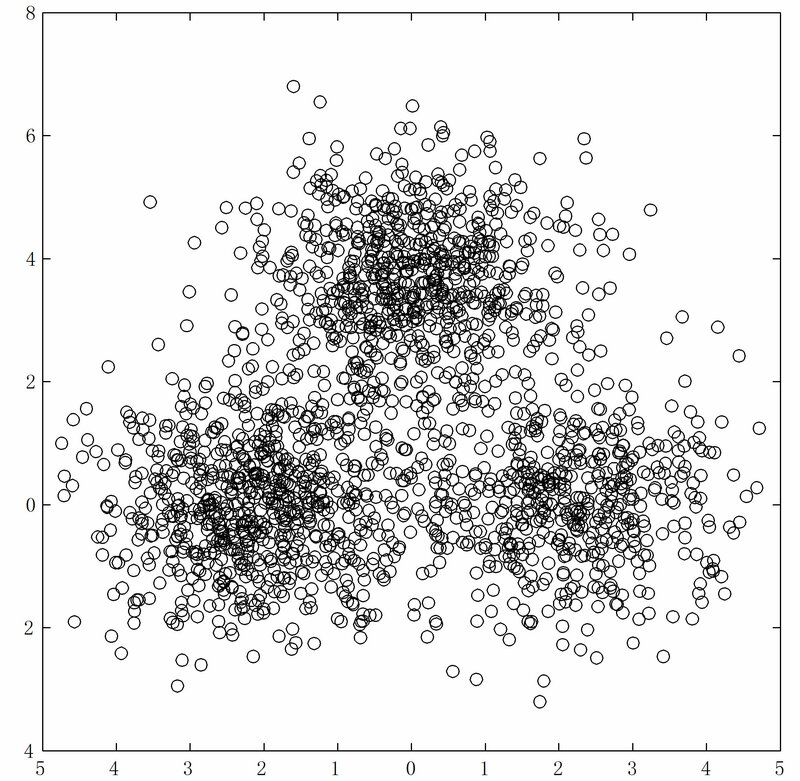 Clusters of other shapes show different patterns in the ODI, whose meaning one can only guess. Our d-curve, however, clearly shows the cluster structures in both cases, where chain-shaped clusters exist. We plan to further investigate and improve the VATdt algorithm, experimenting with it on clusters of different shapes, even with mixed shapes in the same data set. It also interests us to use different metrics, even dissimilarities that are not metrics. We are mainly interested in cases where structures in the ODM exist but the ODI does not show them clearly, at least not in black blocks. The author would like to thank Professor Richard J. Hathaway for his numerous helpful thoughts and suggestions, including the final title of this paper. A. K. Jain and R. C. Dubes, “Algorithms for Cluster­ing Data,” Prentice-Hall, Englewood Cliffs, 1988. J. W. Tukey, “Exploratory Data Analysis,” AddisonWesley, Reading, 1977. 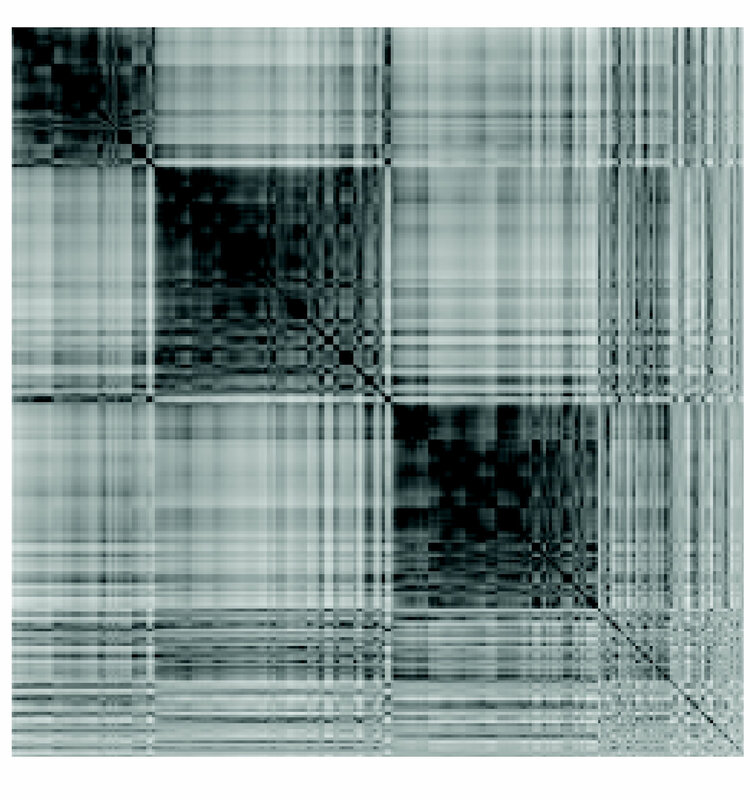 J. M. Huband, J. C. Bezdek and R. J. Hathaway, “Revised Visual Assessment of (Cluster) Tendency (reVAT),” Proceedings of the North American Fuzzy Informa­tion Processing Society (NAFIPS), Banff, 27-30 June 2004, pp. 101-104.